Our family owned business was purchased by Matt Infantino in 1960 and I purchased it in 1978 when he retired. May 2018 marks my 40th year as owner and operator of Sea Mist Thimble Islands Cruise. Now along with my sons we hope you enjoy a tour around the historic Thimble Islands, this summer! 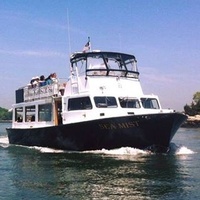 Join Captains Mike, Justin, Bryan and the crew of the Sea Mist as you tour the famous Thimble Islands off the coast of Branford, Connecticut. For nearly sixty years, 1000s of seafarers have enjoyed tours and charters of the Long Island Sound with Thimble Island Cruise. The Sea Mist is a 44 ft. Carmen Boat of Chesapeake Design. This vessel was designed for sightseeing and private cruise with large removable windows and comfortable seating. The Sea Mist can carry 49 passengers for sightseeing and 38 passengers for private charter. There are two decks- the lower which can be completely enclosed and heated when necessary. 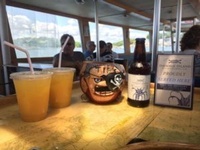 The upper deck is for observation under the sun or stars.The upper and lower decks are equipped with speakers for listening to the live narrated tour or music during private charters.